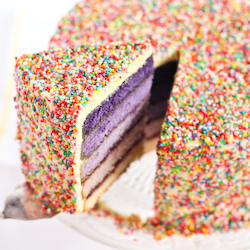 I don't have a proper recipe post for you today. I seem to be suffering a bit of baker's block again, and I didn't want to force the issue by baking something when I didn't feel like it. So yesterday, instead of baking, I woke up super late and I made myself a cheese toastie (aka a grilled cheese sandwich to those in the US) for lunch. I recently had an eye-opening experience with a cheese toastie at the Gazebo Wine Garden and I have been craving them ever since. So I made a very simple sandwich with bread, butter, cheese and garlic. In case it's not obvious from 99% of my blog, I love my sugar. But I love cheese and garlic nearly as much. I'm sure everyone has their own favourite way of making a grilled cheese sandwich, and this is now officially my favourite version. I fried this baby up in butter (wishing I had invested in a cast iron griddle), using a nifty trick I read about online to cover the pan with a lid to help the cheese melt faster before the bread burns. It was golden and crunchy on the outside with a perfectly melted inside. This cheese toastie was good. Effing good. Like the combination of a regular boring cheese sandwich and garlic bread plus a sprinkling of fairy dust. So good that I made another one straight away. And I made one for A and took a photo of it because sharing is caring. Then I ran out of cheese and weeped silently to myself. Roasted garlic is something truly magical, it's sweet, soft, buttery and mild enough to eat on its own, and doesn't give you anywhere near as crazy garlic breath as the garlic sauce from El Jannah (not that the death breath ever stops me from eating it by the bucketload). It might look like a lot of garlic to be eating on its own but the way it's cooked means it's much easier to eat. 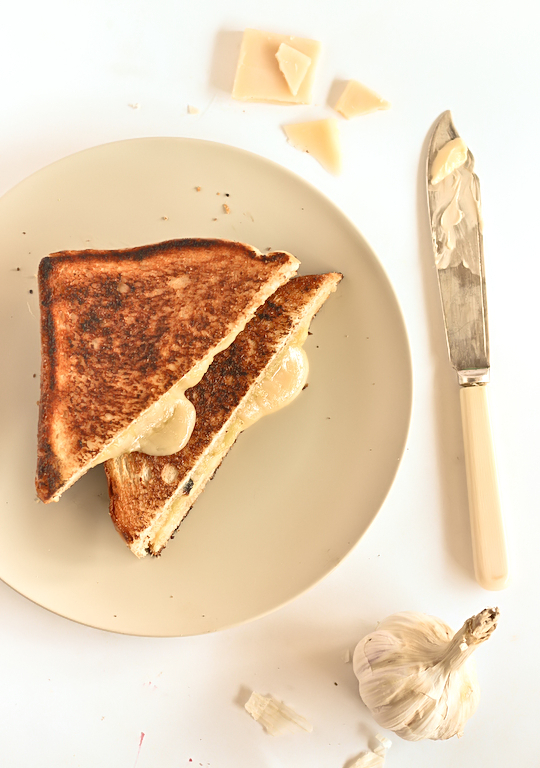 The caramelisation makes it lovely and sweet, which is the perfect addition to that beautiful melty, creamy gruyère cheese in this toastie. It's something so easy and uncomplicated, but your tastebuds will be so freakin happy they might get up and do a little dance. 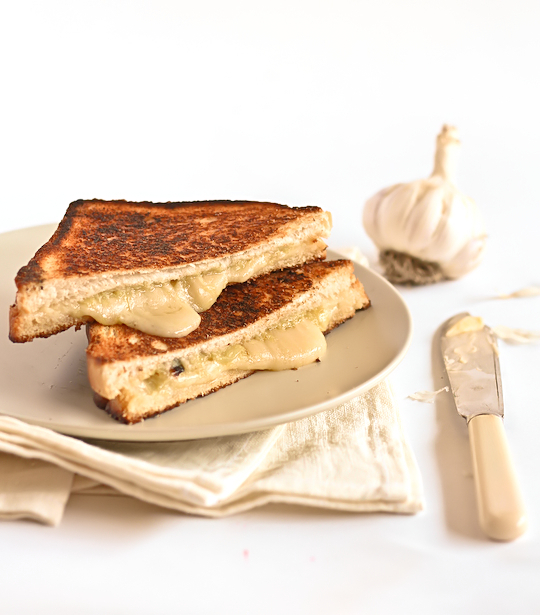 So this isn't really a recipe as it's just a humble grilled cheese sandwich, more like a public service announcement; if you love cheese and garlic as much as I do, you want to be eating this right now. Sometimes it's best to keep things simple, to go back to the basics. Of course gruyère isn't exactly cheap, but it is so worth splurging for it every now and then. Remove the roasted garlic cloves from the head and mash in a bowl. 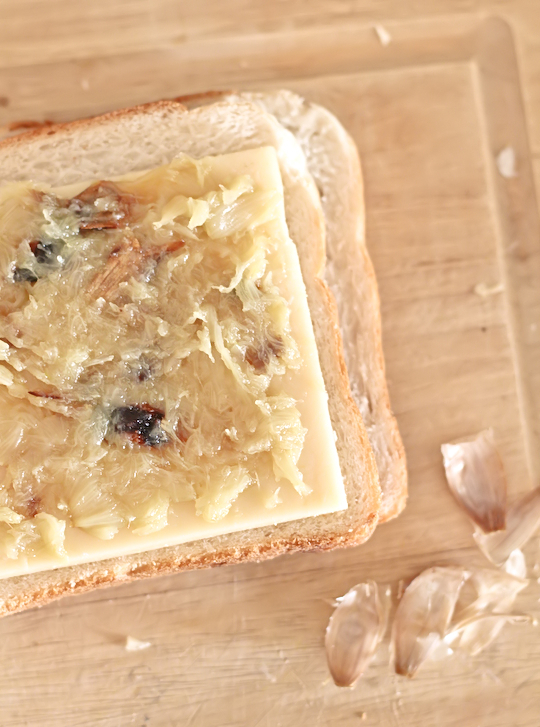 Place cheese on top of one side of bread and spread the mashed roasted garlic over the cheese, top with other slice of bread. Using a non-stick pan or a cast iron griddle, place on medium-low heat with a 15g (1 tbsp) butter and heat until the butter completely melts. Place sandwich in pan, so that the cheese is closer to the bottom of the pan, then cover the pan with a lid or a piece of foil. Fry until the cheese melts and the bread has turned golden brown, about 3 minutes, and then add the same amount of butter to the pan, flip the sandwich over and fry until golden. Eat immediately, try not to make any excessive moaning noises while enjoying the melted cheesy goodness. I was in such a good mood after eating these that I got back in the kitchen and baked something equally simple and satisfying. I guess you just have to stick to the basics every now and then. So I'll be back with a proper baking post in a couple of days. Amazing. The cheese toastie at Gazebo was seriously good but yours looks even better! Love the sound of roasted garlic on it too. Mmmmmm. 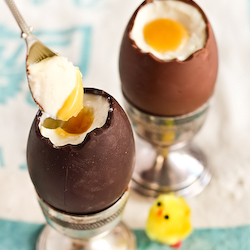 Great simple ingredients, and so satisfying. Love it. Wow, I didn't know you love cheese and garlic nearly as much as sugar. But the toasted bread with melted cheese and aromatic garlic look and sound so good when put together. I just finished dinner, so I'm not hungry. BUT reading this toastie postie makes me want to get up and make this immediately. YUM! I often squish roasted tomatoes into my toasties but have never thought to elevate roasted garlic - it's genius. YUM! Love roasted garlic on anything. This looks so freakin good! You know I was just thinking of cheese toasties this morning and trying to fugure out which combinations would go well together. Roasted Garlic and Gruyere didn't occur to me at all. Steph this looks delicious and I am surely going to be making this for lunch one day this week.. Hi!! The "garlic" idea is veeery cool & fits perfectly with our sandwiches here in Barcelona (We made them with cheese & Ham & call them"Bikinis".., funny, right?). Running to taste It right now!! I need one of these, stat. STAT. I looove roasted garlic and it goes so well with cheese, yum. If you loved toasties, and you're ever in Barcelona, you have to go to Tapac24. They make a 'bikini' toasted sandwich with buffalo mozzarella, jamon iberico and black truffle and it's incredible. I am excited to try this recipe. So simple and easy. I Love it. Oh Im obsessed with garlic sauce haha!! I do love a good toastie! Looks delicious! Toast anything, turn anything into pure amazingness. Good job! Oh my! This sandwich combo looks godly... and omg! You've been to El Jannah!?!? This is the first time that I've seen a Sydney blogger mention El Jannah! haha oh and question, what other cheeses would you replace it with if Gruyere isn't available in your kitchen? Really?? How strange, it's an institution amongst the bloggers I know! Oh any good melting cheese will do, I was supposed to mention that in the post, will update it now! 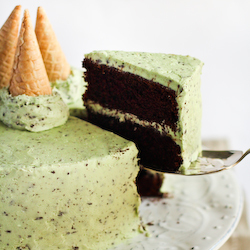 It looks so sinfully delicious! 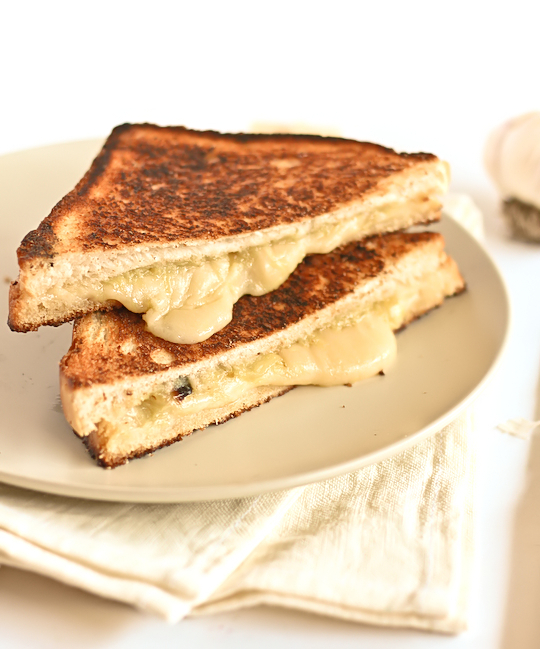 I love cheese and garlic, and grilled cheese is among my favorite sandwiches. Mmm!!! yah! I like seeing savory from you too. Something so simple makes something so delicious! I can't wait to see what else you have come up with! 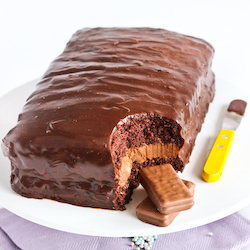 I think I'm going to prepare one just right now! I will probably try to put onion instead of garlic sometime,because I love onion too! This cheese toastie was THE BOMB. And here I was thinking that nothing would ever beat Welsh rarebit for my favourite toastie. Thank you!